Ansonia Clock Company, Royal Bonn, "La Cruz", C. 1904. Name of clock and Royal Bonn stamp on the case where generally found. The apple green case is most attractive for that size. Note the gods or mythical characters molded at the top and base. Beautiful flowers painted all over the front and sides, and a very small amount of gold accent was used. The case is 11.5" high, excellent condition with no chips, breaks, or repairs. Complete with proper back door, and pendulum bob. The movement is 8 day and strikes a gong on hours and half hours. Signed, original paper dial, brass dial center ring, American sash. 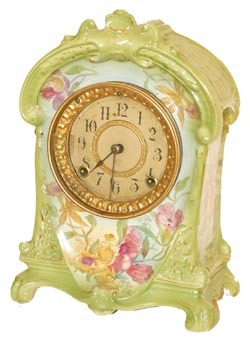 A very nice petite clock. Ly-Ansonia #2685.